At four months old, my little miss is not quite ready to start baby food yet, but I know that that time will be here before we know it and when it does, I plan to make her baby food at home. I like the idea of knowing exactly where her food comes from, what's in it, when it was made, etc. But as a family that does a lot of traveling to visit grandparents, we don't want to miss out on the on the go convenience that squeeze pouches offer...and with the Infantino Fresh Squeezed collection, we don't have to!! 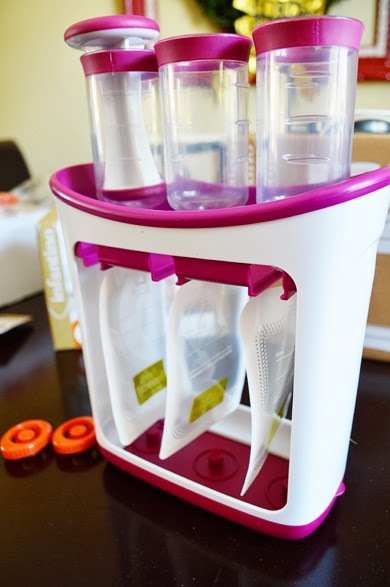 For this review, I received the Fresh Squeezed Squeeze Station, 50-pack squeeze pouches and a reusable squeeze pouch. These are just a few of the products in this collection that make creating your own baby food pouches easy and convenient. It's very easy. First, start with your homemade puree. (You can use the Peppy Puree or Steam & Smush from the collection, or whatever your preference may be.) The pouches are hung securely in the squeeze stations, and screwed into the filling tube. Then add your puree into the tube, and use the press to push down into the pouch. Unscrew the pouch and add the cap and you're done! It is incredibly easy to use and takes the hassle and mess out of filling your own pouches. Once you've made your pouches, you can store in the fridge for two days, or make in bulk and freeze for up to two months. These are wonderful for throwing into the diaper bag when you're out and about. In my opinion, they are much more convenient than carrying around jars of food. And when baby is big enough to self feed they can help to reduce some of that mess too. The pouches are great quality and fairly inexpensive for refills. But if you'd prefer to go with an option to reduce the waste, the reusable pouches are a great option too!! Overall, I was really happy with the Squeeze Station. It was easy to use, convenient and fairly budget friendly. The only real downfall I found for me personally was that the filling tubes were a bit difficult to clean...However, I would say that is probably more so because we do not have a bottle brush. I'm certain it will be much easier once we have one, or for those that have a dishwasher! Do you make your baby's food yourself? Why did you make that choice? What are your favorite purees to make? And how would the Infantino Squeeze Station make it easier for you? Disclosure: I received the products mentioned above in exchange for my honest review. All thoughts and opinions are 100% my own. WE LOVE the squeeze station in our house!!! It makes making food for my son so easy!! I will do a month or two worth of food in a couple of hours & then freeze it! Clean up is a breeze too! These are really neat products! If we would have made baby food, I would have definitely looked into these! We did baby led weaning. A person could save a boatload with this! The pouches are sooo expensive in the store, they know that people like the convenience, but the cost is prohibitive to really go for it. This is perfect!! !